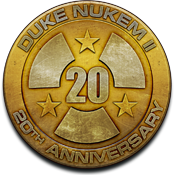 Joe Siegler, former 3D Realms employee, reflects on the 20th anniversary of original Apogee games Duke Nukem II and Blake Stone. It's worth a read! It’s December 3rd, 2013. That means that 20 years ago, it was December 3rd, 1993. What is the big deal with that? Well, a company I worked for released two new games on that date. “Blake Stone: Aliens of Gold”, and “Duke Nukem II”. That’s right, Apogee (my Apogee, not the current one – from here referred to as just “Apogee”) put out a couple of new games that day. If I was still at my former job, this is the kind of piece I’d write for the website. But I’m not there anymore, and I didn’t want the dates to pass unremarked. So here we go. A few thoughts from me on these two titles.